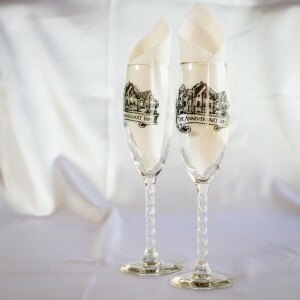 Each champagne flute is adorned with the Anniversary Inn logo. Give your partner a sweet surprise with one of our boxes filled with savory chocolate treats. 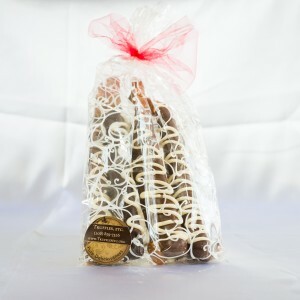 Each box is filled with an assortment of eight delicious hand dipped specialty truffles. Can be pre-ordered to be placed in suite before arrival, or purchased on-site. Large, decorative natural bubbling bath bomb. Assorted designs and scents. Chocolate Hershey Kisses are always a tender gesture, and yummy to eat. 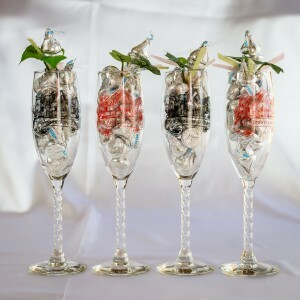 Hershey Kisses inside a pair of traditional champagne flutes with ivy and ribbon. Each champagne flute or mug is adorned with the Anniversary Inn logo, and is a wonderful keepsake to remind you of your romantic stay here. 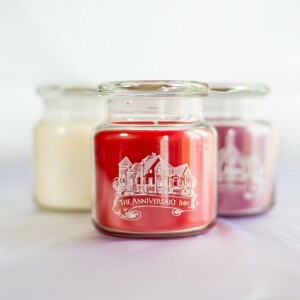 16 oz Anniversary Inn logoed jar candle. Assorted fragrances. Big bucket of fresh popcorn, 2 Coca-Cola products, and choice of 2 candies from our candy assortment. Waffle weave one size fits all robe. Embroidered with the Anniversary Inn logo. Fresh, vibrant colored rose petals available by the bag. Scattered around your suite prior to arrival. Skin Seductions Bath Fizzie - $6. A soothing addition to your jetted jacuzzi tub; these fizzies calmly bubble with an effervescence, scented with a subtle fragrance. Assorted scents of luscious massage oil provided by Skin Seductions. * Can be pre-ordered to be placed in suite before arrival, or purchased on-site. 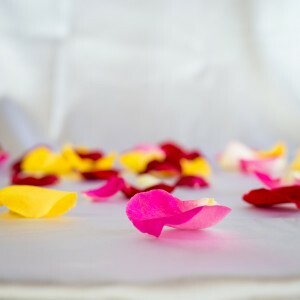 Includes rose petals strewn in your suite before check in, 3 battery operated votive candles, a bath bomb, one hour massage, a bottle of massage oil, an early check in at 3pm and and a late check out the following day at 2pm. *Battery operated candles may be traded at check out for wax candles. $90 cost of massage will be charged at time of booking. You must call the Anniversary Inn to schedule your massage. Massages can be split into two 30 minute massages. Not all rooms accomodate massage tables. . Room price and tax not included. Enjoy a soothing romantic experience by candlelight. 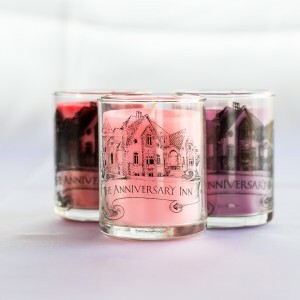 Includes 3 battery operated votive candles, a bath fizzie, rose petals strewn in suite before check in and an early check in at 3pm. *Battery operated candles may be traded at check out for wax candles. THE ANNIVERSARY INN IS "FLAME FREE"
Room price and tax not included. This package includes a bath bomb, an early check in at 3pm and a Movie Snack Pack (includes big bucket of popcorn, two drinks and two large boxes of candy). THE ULTIMATE PACKAGE! Includes rose petals strewn in your suite before check in, a single long stemmed rose, a one hour massage, 2 Anniversary Inn logoed robes, a bath bomb, a box of hand dipped truffles, 2 Anniversary Inn logoed champagne flutes filled with chocolate kisses, a snack of your choice, an early check in and a late check out. This package has it all! Includes Anniversary Inn logoed champagne flutes filled with Hershey Kisses, rose petals scattered in your suite, three battery candles, a bath bomb, a snack of your choice, and an early check in at 3pm. *Battery operated votive candles may be traded at check out for wax candles. Includes 2 bottles of water or soda, massage oil, a bath bomb, a pair of logoed champagne flutes filled with chocolate kisses, a snack of your choice and an early check in at 3pm. This package includes A Romance spa box (massage oil, jumbo heart truffle, shea butter bar, bath sponge, body polish, body frosting and bath salts), 3 battery operated logoed votive candles and an early check in at 3pm. *Battery operated candles may be traded for wax candles at check out. *The Anniversary Inn is FLAME FREE. This package includes three battery operated Anniversary Inn logoed candles, rose petals strewn in your suite before check in, 6 chocolate covered strawberries ,(Boise or Salt Lake) or a box of hand dipped truffles (Logan), a snack of your choice and a late check out. *Battery operated candles may be traded for wax candles at check out. 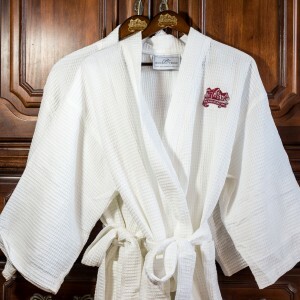 This package includes 2 Anniversary Inn logoed waffle robes, rose petals strewn in your suite before check in, a bath bomb, 2 coke products, a snack of your choice, an early check in at 3pm and a Romance spa box (massage oil, jumbo heart truffle, shea butter bar, bath sponge, body polish, body frosting, and bath salts).